Because when you make something for yourself, it doesn't have to be strive to be "as good as" ready-to-wear... it can be BETTER than that. Because it is your size, your colors and YOUR hands that made it. A sweater (or any project, really) that takes this long (almost a year! but that includes a six-month knitting break) is like a slice of an ancient tree—like the rings in a tree, each row is from a certain moment in time. Like the moment in time I accidentally left one skein of discontinued bright purple yarn I was using for the third stripe on a plane... and had to change my stripe repeat from a "bright purple/light purple/gray" pattern to a "gray/light purple/gray pattern:"
What mass-produced fast-fashion garment has a "flaw" or a story like that? The pattern: Delancey cardigan by Alexis Winslow of Knit Darling (available in regular and plus size). 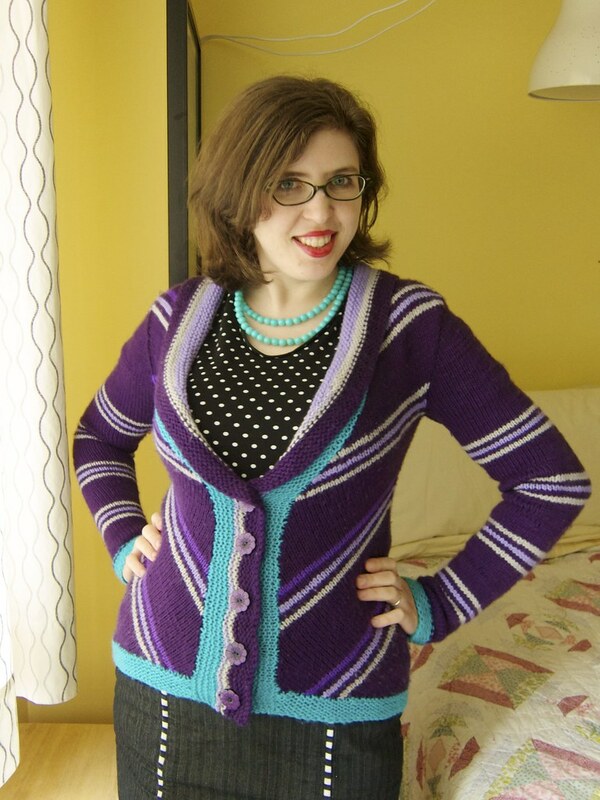 I think it is fair to say Alexis Winslow is my most favorite knit designer ever stripes ever polka dot ever. I loved making the Delancey as much as I loved making Georgina, and I'm pretty equally pleased with the results and sure I will wear her as much as possible (weather permitting—this wool Delancey is HOT). The construction was unusual and varied enough to be interesting, but still easy to memorize and knit while riding a subway, chatting with friends or giving my kid a bath. The yarn: Knit Picks Merino Style — a discontinued but very soft and lovely to work with merino DK weight yarn that had been languishing in my stash for YEARS. Sizing notes: I knit the 33-inch bust size—which SOUNDS like a bad idea since I have a 38.5" bust—but wasn't at all. Remember the power of negative ease and the tendencies of many yarns to grow when blocked! 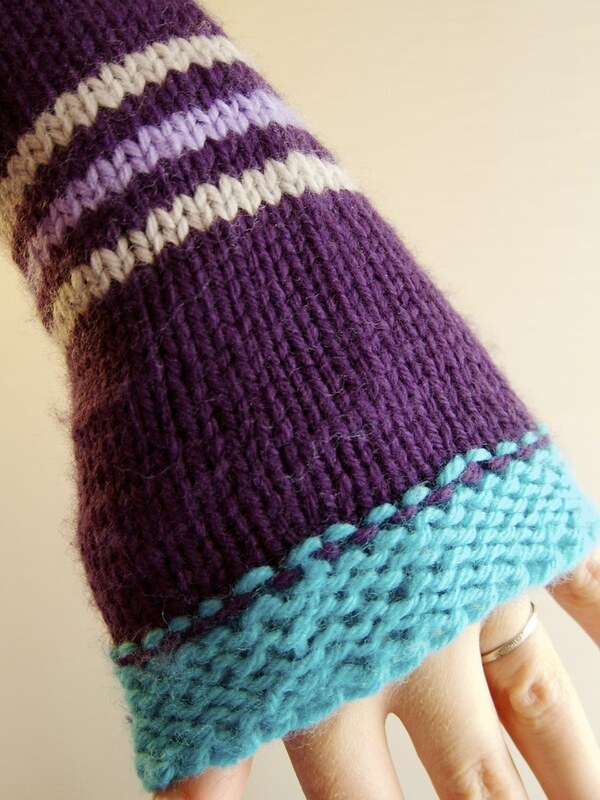 I had actually emailed Alexis for her advice and she told me the bias handknit fabric was EXTREMELY stretchy. And because of the chevron design, this is a straight up and down piece—there's no way to create waist shaping or definition except by making it snug. When I was knitting I kept second-guessing this decision, but now that she's blocked the fit is PERFECT and not at all tight or uncomfortable. 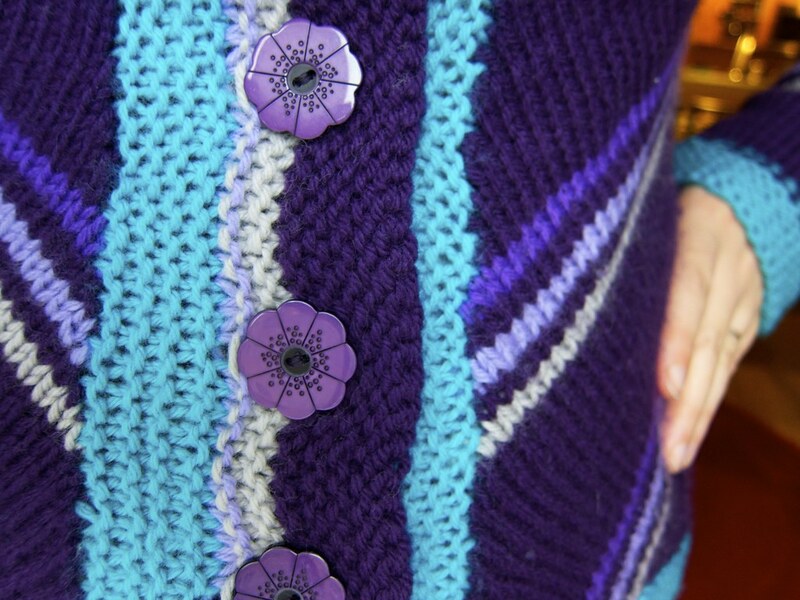 Notions: Purple floral buttons from Pacific Trimming. Mods and construction notes: I knit the shorter version as instructed here. As per Alexis' email advice I tacked down the shawl collar back to keep it from rolling up. And I used the Back Join to change colors while striping. Raveled with more info here. 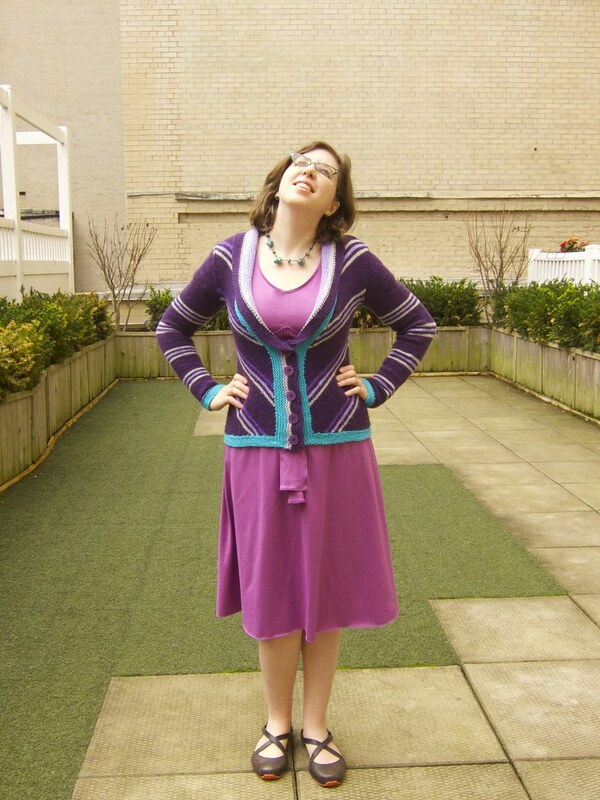 Of course now it is over 80 degrees F here in New York... so I'm hoping for a few more brisk days to enjoy my cardigan joy before summer really comes rolling in. Where's a chilly rainy day when you need it? It's lovely and you do have quite the story to tell with it! Indeed, it could not be bought for any price. So gorgeous! I love everything about it. Nice photos too! The photos were a struggle. I did a whole outdoor photo shoot with the selftimer and 95% of the pictures were unusable because the lighting came out weird. Finally just took pictures by the window in my daughter's bedroom and the yellow walls seemed to make a nice warm light. Thanks Sarah! I am going to wear it like, EVERY DAY when it is cold again. It's a beauty! What lovely colours and the purple is great on you! Mikhaela, It's beautiful! You always take such care when you make things, and it shows. I love seeing your progress pictures and hearing about the process. I hope to see you an more of my designs in the future! This turned out so pretty. Even though it took a year, it seems like it would be worth the time investment.